Once again, the Dr. Hourig Sourouzian's team made finds in the Funerary Temple of Amenhotep III (see our news of 02/03/10, 22/03/10, 17/05/10, 02/10/10, 16/12/10 and 27/04/11): 200 metres behind the Colossi of Memnon close to the former 3rd pylon the mission unearthed an alabaster colossus of the great king. The statue is the northern one of a pair of colossi collapsed during an earthquake in antiquity. 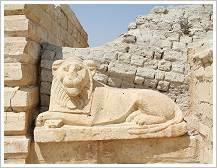 Other parts of the statues like the back of one throne had already been discovered, others lay in a layer of Nile alluvium. 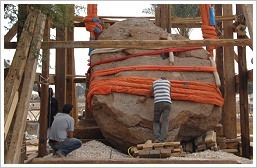 After restoration of all parts of the statue it will be 18 metres highlike the Colossi of Memnon. Until now there is no other statue from alabaster in this height - only its head measures 1,20 metre in height. On the central part of the temple’s court Dr. Sourouzian’s mission further discovered the 28.5 cm high granodiorite head of a male deity and a 7.4 metre tall broken red quartzite stele depicting Amenhotep III Amenhotep III and his wife Tiye bringing offerings to the gods, Amun-Re and Sokar. At last, there was a "reunion": After searching inside the storerooms of Luxor the mission found and reattached the beard of a red granite head of Amenhotep III being exhibited beardless at Luxor Museum on the east bank. After the revolution, many creative ideas were born to revive Egypt's tourism industry but the newest one is just disgusting: An Egyptian stuntman bought - of course illegally - a 280 kg African lion at the price of 25,000 LE (about 3,000 EUR). He plans to fight the animal by using a dagger and an iron shield - and to kill it in the interests of tourism - in front of the Giza pramids on 25th of June. May the cleverer win...! Well, hopefully the madness can be stopped in spite of official authorisation. Please sign the petition "Stop al-Sayed al-Essawy from murdering an innocent lion". Leipzig's Steindorff Collection to Go to Israel or Egypt? Already in 2009 at the request of the Conference on Jewish Material Claims Against Germany (JCC) a German federal office ruled that the University of Leipzig has to hand the private collection of its former professor for egyptology, Prof. Dr. Georg Steindorff, to JCC. The university filed a suit against this decision. But back to the actual case. The University of Leipzig thinks about to go to law against the decision that all decisions are final. But Egypt has an eye on Steindorff's collection, also. The MSA (Ministry of State for Antiquities) sent an official letter to the JCC demanding restitution of the artifacts and threatened to file a suit against it at the International Court of Justice if the JCC did not comply. 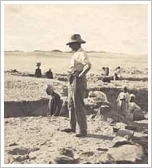 Steindorff found the objects in 1915 during excavations on the Giza plateau. The collection spans more than five millennia and includes an important medical papyrus (Ebers Papyrus) as well as a small limestone head of Queen Nefertiti. 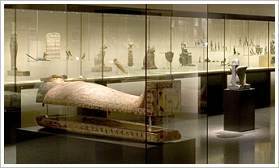 It was housed in the Egyptian Museum of the University of Leipzig which owns about 7.000 Egyptian artifacts. Around the Great Pyramid of Giza, there are many mysteries. Now, one more is revealed. 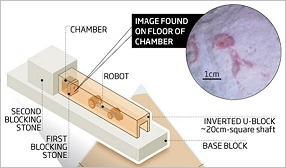 In the context of the "Djedi Project" an international team of archaeologists explored by use of a robot the secret chamber located at the end of the southern shaft, which leads out of the Queen's Chamber. The "Djedi Robot" named after the magician that Khufu consulted when he planned his tomb was equipped with a micro “snake camera”, a miniaturised ultrasonic device, a miniature ‘beetle’ robot that fits through a hole 2 cm in diameter, a precision compass, an inclinometer and a coring drill. By looking through the hole drilled in the first door in 2002, the robot's innovative snake camera discovered another (rough and unfinished) door at the end of the chamber. On the floor in front of this second door the camera revealed hieroglyphs written in red paint. Since the camera is able to see around corners like an endoscope it sent also images of the back of the first stone door and the metal pins in it for the first time. The results of this first exploration are published in the current issue (vol. 84) of the journal "Annales du Service des Antiquités de l'Égypte" (ASAE). Since 3 months the return was announced, now it is accomplished: the just 17 x 15 cm wide New Kingdom limestone relief that depicts an unknown man was repatriated the day before yesterday. 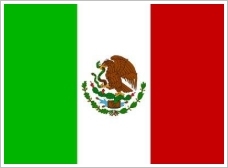 In 2006, Mexican customs authorities caught a Mexican citizen in possession of the relief red-handed and seized the artifact. Authenticity is proven. 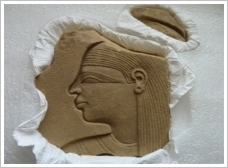 The broken relief will be restored and then placed in a special display at the Egyptian museum. 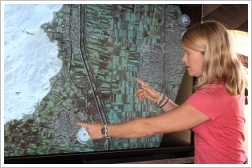 The American Egyptologist Dr. Sarah Parcak and her team did research on lost archaeological sites in Egypt for over one year. What she found by using high resolution satellite imagery was impressive: 17 pyramids, more than 1,000 tombs and 3,000 ancient settlements. The team analysed images from NASA satellites orbiting 700 km above the earth, equipped with cameras so powerful they can pin-point objects less than 1 metre in diameter on the earth's surface. Infra-red imaging was used to highlight different materials under the surface. Because Ancient Egyptians built their houses and structures out of mud brick, which is much denser than the soil that surrounds it, so the shapes of houses, temples and tombs can be seen. But these are just the sites close to the surface. How many thousands of sites may be hidden under high sand and silt? Parcak came with a BBC camera team to Egypt to verify the images on site and shoot a documentary. She persuaded the authorities to make two test excavations in Saqqara where she assumed the existence of two pyramids - quite rightly. 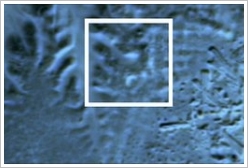 In Tanis, they excavated a 3,000-year-old house that the satellite imagery had shown. The outline of the structure matched the satellite imagery almost perfectly. The documentary "Egypt's Lost Cities" airs on BBC One on Monday 30 May at 20:30 BST. Only in rare and special circumstances, the American John F. Kennedy Profile in Courage Award has been made to foreign officials. It is awarded annually by the Kennedy Library Foundation in Boston to a public official whose actions best demonstrate the qualities of politically courageous leadership. 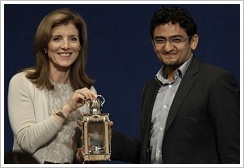 In 2011, on May 23, Caroline Kennedy, daughter of President John F. Kennedy, presented the award to Wael Ghonim, who was named a recipient on behalf of "the people of Egypt". 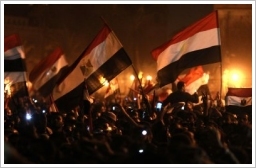 The former Google executive launched Facebook pages that sparked protests in Egypt, which led to the ouster of former Egyptian President Hosni Mubarak (see the news of 11/02/11). Ghonim was detained by Egyptian police but after 12 days released because of international pressure. His very emotional interview (on Youtube with English subtitles) on the events at Cairo's Tahrir Square during the revolution and the fact that he returned to that place after his release made him to a leading figure of civil courage although he always refused to be hailed as a hero. Currently, Ghonim is writing a book entitled "Revolution 2.0": "I say that our revolution is like Wikipedia, OK? Everyone is contributing content. You don't know the names of the people contributing the content ... This is exactly what happened. Revolution 2.0 in Egypt was exactly the same ... Everyone was contributing small pieces, bits and pieces. We drew this whole picture of a revolution. And that picture — no one is the hero in that picture." Already 1500 years ago canal irrigation was used along the River Nile in Nubia. And already then man created illnesses by interventions in nature. 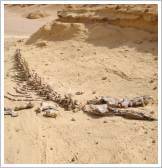 An analysis of mummies from Nubia, a former kingdom that was located in present-day Sudan, provides details for the first time about the prevalence of the bilharzia disease across populations in ancient times, and how human alteration of the environment during that era may have contributed to its spread. The study tested samples from two Nubian populations for bilharzia agents. 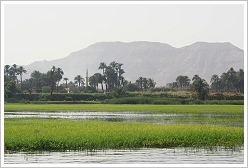 One poulation (group A) lived 1,200 years ago, during an era when Nile flooding was at its highest average known height, and archaeological evidence for irrigation is lacking. The second population (group B) lived further south along the Nile, about 1,500 years ago, when the average heights of the river were lower. Archeological evidence indicates that canal irrigation was used to sustain multiple crops. The result: 25 percent of group B showed evidence of the bilharzia agent Schistosoma mansoni, while only 9 percent of group A were infected (Study pubished in: American Journal of Physical Anthropology, vol. 145, issue 2, p. 290–298, June 2011). In order not to bring a "souvenir" from Egypt along with you take care not to stroll through irrigation canals carrying water and flooded shorelands of the River Nile! There is no other prevention. An infection between persons is not possible. Since last night the lighting system at the Theban Hills is working again. The impressive illumination which changed the nocturnal scenery of the West Bank since December 2010 contrastily (see the news of 02/12/10) was switched off in consequence of the January Revolution. Ras Mohammed National Park Saved! HEPCA (Hurghada Environmental Protection and Conservation Association) acquainted just this minute, that the Governor of South Sinai reverted his previous decree to allow commercial net fishing in the natural protectorate (see the news of 16/05/11). Thanks a lot if you helped and signed the petition. Ras Mohammed National Park at the south of the Sinai Peninsula is facing a crisis. At the beginning of May the responsible governor lifted the ban for commercial net fishing within this delicate Red Sea habitat during the month of June. 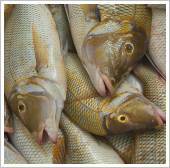 The month of June is spawning season for the valuable emperor fish (Lethrinus Nebulosus). 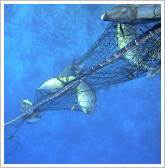 Net fishing in the Red Sea is actually banned from the end of May to the beginning of September. Since the decision is published dozens of commercial fishing boats have already been sighted operating within the waters of Ras Mohammed. Many environmental authorities, tourist institutions and dive-operators critizised the governor's decision that not only violates two laws but also destroys the natural protectorate ecologically and economically. Why ecologically should be clear - economically because the coral reef of Ras Mohammed is a popular destination for divers. 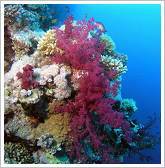 The area is home to more than 1000 species of fish and more than 220 species of coral. You can help with your signature: Click here to sign the petition "STOP fishing in Ras Mohammed National Park". 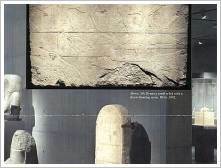 After the Antikenmuseum in Basel had discovered that a displayed stele had been stolen from a tomb in Saqqara about 10 years ago it voluntarily offered its return to Egypt. The limestone relief (83 x 51 cm) dates back to the 5th dynasty and shows the tomb owner in a hunting scene. 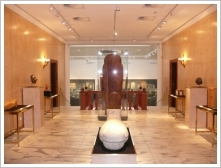 The museum displays 600 artifacts in its Egyptian collection and owns 360 of them. When the UN proclaimed the year 2002 as the "Year for Eco-Tourism", first of all Egypt was helpless. How could a country which is surrounded by three deserts participate in this project? However, one made a virtue out of necessity. In fact, each of the three Egyptian deserts has its extraordinary character encompassing its unique history, myths and potentials which are necessary to develop. In the meantime, many ecolodges have been built where specially trained and certified workers help to preserve the protected areas and give the tourists an understanding of the uniqueness of the deserts. 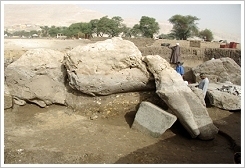 Now, on 8th of May, 2011 the nearly 4,000 years old site of Medinet Madi was opened to the public along with a visitor centre and an eco-lodge. Medinet Madi, located in the Fayoum region, was a farming village dating back to the 12th dynasty. There are the ruins of the only known Middle Kingdom temple in Egypt, dedicated to the cobra-headed goddess Renenutet and the crocodile god Sobek. Since 1978, the Università di Pisa, Italia, carried out exploration work at Medinet Madi. So far, the project successfully cleared the archaeological site of intrusive sand, restored its monuments, undertook comprehensive archaeological survey as well as mapping of the site, built the visitor centre and the eco-lodge. During excavations the archaeologists uncovered a Ptolemaic temple dating to 332 - 330 BC, a fortified camp dating to 284 - 305 AD and ten Coptic churches dating to the 5th - 7th centuries AD. Concurrently, the 1st Archaeological Park of Egypt was created. Fully equipped with tourist facilities it connects Medinet Madi to the sites of Wadi el-Rayan (largest waterfalls in Egypt) and Wadi el-Hitan ("Whale Valley", Egypt's only natural World Heritage Site) with 28 km of unpaved, naturally surfaced roads. On 2nd of May, 2011, the tourism and antiquities police succeeded in landing a new coup. 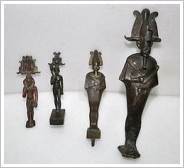 In its course 4 bronze statues dating back to 688 - 332 BC could be seized. Two of the relics depict the god Osiris while the other two depict Harpocrates (Horus the younger). However, to everyone's surprise just two of them were stolen from the Egyptian Museum during the January Revolution: One of the identified statues is 37.5 cm tall depicting the god Osiris and the second is an 18 cm statue of the god Horus when he was a child shown with his finger in his mouth - it was a symbol of childhood, but the Greeks misinterpreted the gesture and adopted him as Harpocrates, the god of silence. The provenance of the other two statues is outstanding. Incidentally, Interpol will publish photos of the still missing objects in the international market, a measure that will help in recovering these objects.